S3i Group have produced high strength structural tie bars and components with a very high quality finish for architectural and structural applications since 2000. Our tie rod systems are manufactured in carbon steel and stainless steel to the highest standards. All our tie bar components are tested for material quality and tolerances so that you can buy from us with confidence. We have vast experience with tie rod systems and can offer friendly help to architects, specifiers, designers and also end users. 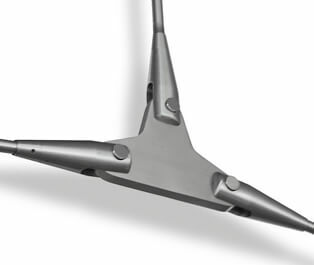 Please note: Carbon assemblies are supplied as galvanised fork assemblies with self-colour carbon rods as standard. These assemblies can be painted to suit each individual installation and to protect from the elements. Please contact our technical team for further details. All our structural and architectural tie bar systems are manufactured to a high specification from high tensile stainless steel materials, with the choice of 316 grade stainless steel, duplex stainless steel and carbon steel options available. These structural tie body and compression struts are perfect for architectural use, with yield strengths of 520N/mm². With an option of finishes: stainless steel finished in either a satin as standard and high polished available upon request. Carbon steel supplied as self colour, painted or galvanised. Our systems provide a technical solution to suit most tie bar situations, for further information please contact our experienced technical team on 01302 752 504 or email us. 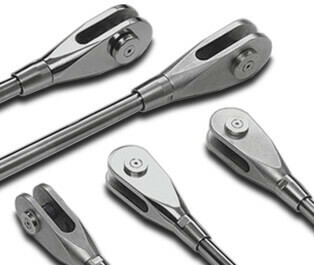 High strength bar with threaded forks at each end. 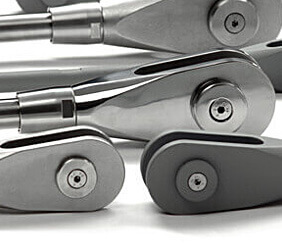 Length adjustment to the tendon is achieved by simply rotating the bar once installed. Usually used in applications where a greater length adjustment is required. With an adjustment of +/-50mm on M20 and above using a standard turnbuckle. 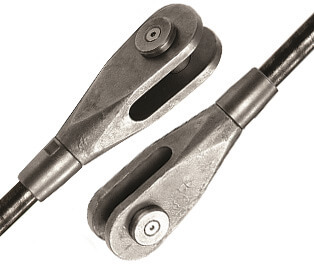 Threaded fork ends are used to terminate bars and transfer load to the structure. Supplied as left-hand or right-hand threaded - dependent upon the tie rod arrangement. Central connectors, usually circular, to accept an arrangement of fork to fork tendons at a central point. The locking thread cover designed to cover the exposed threads, when tightened against the fork the tendon is locked at the set length. Standard pins are designed as a pin barrel with end caps, giving you a neat and tidy finish. Turnbuckles designed to allow threaded bar connector adjustment, the machined central chamber allows for greater length adjustment. Important information regarding architectural tie bar specification from S3i Group. View some of our architectural tie bar projects, manufacture & installation by S3i Group. Stainless steel wire rope bridge railing and structural support cable installations. Stainless steel wire rope assemblies for architectural and landscaping applications.